When the hedges you have on your property grow to a certain stage, it would be almost impossible to trim them with a normal handheld hedge trimmer. They grow so tall, and you begin to wonder how you’re going to trim them and keep them in shape. Well, the answer to this dellimer of tall overgrown hedges is a telescoping hedge trimmer. With a telescoping hedge trimmer, you get a hedge trimmer with a shaft or pole whose length can be adjusted according to the size or height of your hedges. The cutting head or trimmer head of the telescoping hedge trimmer can also be pivoted into different angles or positions which affords you the ability to trim or the sides of your hedge maybe from one side or help you trim at a position suitable for you. Some telescoping hedge trimmers come with a pole or shaft that can be removed and the trimmer head can be fitted with a normal hedge trimmer handle to convert it to normal hedge trimmer, offering you dual modes of operating the same tool. All and all, a telescoping hedge trimmer affords you or helps you gain further overhead reach when trimming tall overgrown hedges that are out of reach when using a normal handheld trimmer. In this article, I review the top 6 telescoping hedge trimmers, going through their features, their pros and cons so that you can choose the best one perfectly suited to your needs. Dewalt promises guaranteed gas performance in their telescopic pole cordless hedge trimmer, the DCHT895M1, which without mincing words, is definitely one of the best telescoping hedge trimmers out there. 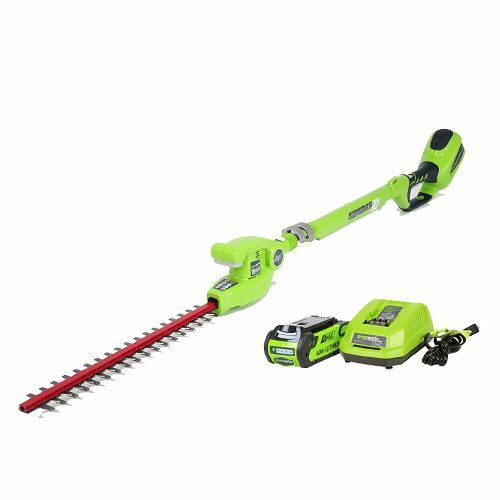 It comes equipped with a 45 inches telescopic or retracting shaft which extends up to 70 inches to increase the user’s reach and trim hedges and shrubs that are out of reach. You can easily retract it back to 45 inches when you need to work in a compact space or when the hedges to be trimmed are within your reach. 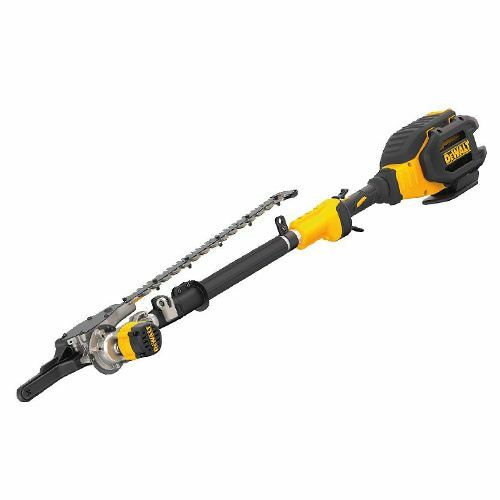 The Dewalt DCHT895M1 telescopic trimmer is equipped with 22 inches double edged or dual shear, laser cut blades with 1 inch cutting gap between them, which works very well for trimming thick shrubs and tree branches that are even up to 1 inch thick efficiently. At the heart of the whole setup is a powerful brushless motor which delivers up to 3700 strokes per minute to help power the trimmer through cuts. The DCHT895M1 is a cordless trimmer, which means it’s battery powered. The battery it makes use of is a 40 volts Dewalts battery which actually changes to 36 volts when the trimmer is under load. When fully charged, you can keep it running and trimming for up to 90 minutes at a stretch. That’s over an hour of trimming without the inconvenience of pulling cords or wires with you, as it’s totally cordless. For over 90 minutes, you can even keep one battery charging if you have 2, and use one to run the trimmer. By the time you exchaust the first battery, you’ll have another fully charged one, ready to go. The trimmer weighs just 15.8 pounds, which is a little bit on the heavy side, but not too heavy to be handled. Overall, the Dewalt DCHT895M1 telescopic hedge trimmer is definitely one of the best telescopic trimmers out there. If you have other trimmers that don’t allow you to get the job done due to their limited reach, then this Dewalt cordless trimmer will definitely help you get the job done efficiently. When it comes to talking about electric power tools, especially corded ones, Sun Joe’s name normally pops up more than ones. They do produce some good quality and low cost electrical power tools, as you’ll come to witness firsthand when you get the Sun Joe SJH904E electric telescoping hedge trimmer. The Sun Joe SJH904E is a 4.5 amp telescoping hedge trimmer with 19 inch double edged dual action blades that cut in both directions to help you trim your hedges and shrubs effortlessly. It equipped with a telescoping pole that can be transformed or adjusted from a length of 3.8 ft to 5.9 ft to help you reach the tallest hedges and shrubs in your garden or sidewalk. The telescoping feature helps you gain up to 13 inches of overhead reach to make working with it easier. Apart from using the telescoping feature, you can also detach or swap out the telescoping pole and replace it with a handheld handle for trimming short hedges within arm’s reach. Still talking about transforming the trimmer, you can remove the hedge trimmer head, and replace it with the Sun Joe GTS4000E-8CS-CGY chain saw attachment for trimming overhead tree branches and even thin logs which are not within your reach. The head of the trimmer can be pivoted into different angles depending on what’s suitable for you to work with. It can be pivoted from -20 degrees with increments of 20 degrees to 60 degrees. Overall, the Sun Joe SJH904E telescopic electric hedge trimmer is definitely up there among the best. If there’re tall hedges and shrubs in your yard, and you need them taken care of ASAP, then this is surely one of the best telescopic hedge trimmer you can choose today. Black+Decker roll into the game with their LPHT120 telescopic hedge trimmer. 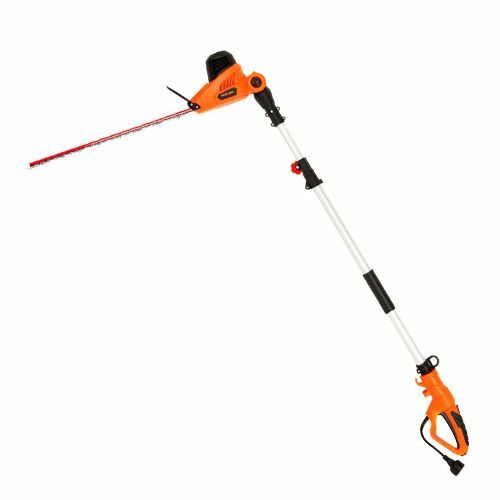 It’s a 20 volts cordless pole hedge trimmer that can be transformed to a length of 6-1/2 feet, which makes it suitable for trimming up to a height of 10 feet. If you have tall overgrown hedges and shrubs in your yard, then the Black+Decker LPHT120 cordless pole hedge trimmer is one of the best trimmers you can use to get the job done quickly. The trimmer head can be pivoted through 180 degrees and locks into 5 positions to enable you trim the top, edge and even behind hedges and shrubs which helps you work precisely and also helps you trim at a posture or position convenient with you. The LPHT120 cordless telescopic trimmer only weighs 7.7 pounds which makes it one of the most lightweight telescopic trimmers, with the lightweight design allow you to work efficiently without getting tired too quickly. As for the trimmer blades, they’re 18 inch dual action blades which allow you to cut in both directions and cut through branches as thick as 7/16 inches in thickness, while working with 40 percent less vibration. Overall, the whole unit is built strong and sturdy, and it works efficiently as a hedge trimmer should. The only drawback is that the trimmer head locks only into 5 positions, which is good but not enough. Being able to rotate it through more positions will increase the versatility of the tool. When it comes to Cordless tool Manufacturers, 5 names will not be mentioned without mentioning Greenworks. They manufacture top notch battery powered tools. 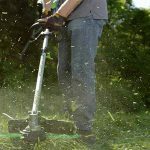 That’s why I didn’t hesitate to include the Greenworks 2272 40 volts cordless pole hedge trimmer in this list. If you need a cordless telescoping saw, this Greenworks is one of the best you’re going to get. The hundreds of positive reviews its garnered proves just that. 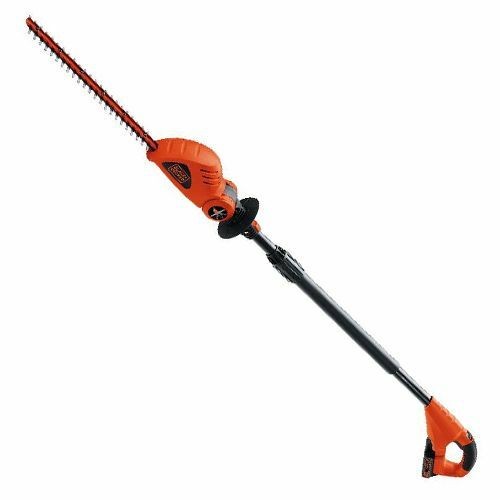 It features a shaft or poles that increases the length of the hedge trimmer by 6.5 feet, which allows you to reach tall overgrown hedges and shrubs. As for the blade, it’s a dual action blade, 20 inches in size that cuts in both direction for optimal performance, and maneuverability. The trimmer has a cutting capacity of 5/8 inches which is quite enough to cut the hedges and shrub in the average Joe’s backyard. As for the trimmer head, you can adjust it to 8 cutting positions to trim at different angles depending on the part of the hedge you’re trying to trim or the position that you’re comfortable with. 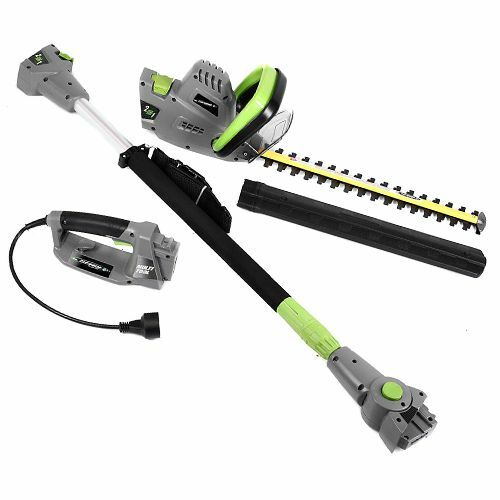 Additionally, if you already have or use other Greenworks cordless power tools, then you’ll find the G-Max 40V lithium ion battery that comes with this Greenworks 2272 pole hedge trimmer very useful, as you can also use it to power your other Greenworks cordless power tools. The battery really holds up even through heavy use, and you can be rest assured to get lots of run time from one single charge of the battery. 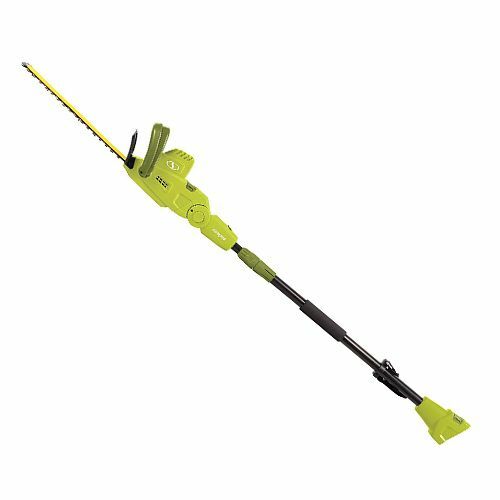 Overall, the Greenworks 2272 telescopic or cordless pole hedge trimmer is definitely one of the best telescopic trimmer out there, and it’s good for the money, especially if you already have other Greenworks products. The only con is that the shaft or pole looks a little bit flimsy, but for what it’s worth, it’s okay. What’s most important is that it gets the job done, as you’ll come to see if you purchase it. When you get the Earthwise CVPH43018 telescopic hedge trimmer, you get a pole hedge trimmer that has a maximum length of 8.8 inches, which can be converted to a normal handheld hedge trimmer. This can be done just by replacing the pole with a normal hedge trimmer handle, to decrease the reach and trim smaller hedges and shrubs that can easily be trimmed using the hedge trimmer without the pole extension. With the pole extension, you get a total overhead reach of 13 inches with the trimmer, which allows you to really trim tall overgrown hedges with it. The trimmer blades are 18 inches in size and they have a cutting capacity of 11/16 inches which is just okay for trimming your average hedges and brushes around your home. As for the trimmer head, it can be rotated into 6 different directions or angles for cutting at different positions, and also very good when cutting the top or behind hedges. Basically useful when you’re trying to shape your hedges with your trimmer. At the heart of the whole setup is a powerful 4.5 amp motor which helps power the trimmer blade through your hedges. There’s an included blade cover to cover the blade and stow the tool away when it’s not in use, which is something I really like. Some people complain about having to keep the power button pressed to keep the trimmer working, and not just being able to press it ones and keep it on. Well, that a safety feature that’s meant to keep you safe and avoid injury from poor handling of the trimmer. In case of poor handling, the trimmer goes off immediately your hand is off the power button, preventing the trimmer from going on running and possible giving you a messy injury. If I’m to point out a downside for the Earthwise 4.5 amp pole hedge trimmer, it would be the weight. Working overhead with it becomes tiring after a while due to the weight of the tool. But even that is to be expected of any tool. So, overall, the Earthwise telescopic or pole hedge trimmer is definitely one of the best trimmers out there if you have tall out of reach overgrown hedges in your property that you need to maintain. Without being extended, the telescopic pole of the Garcare GPHT07 telescopic hedge trimmer already boasts an impressive length of 7.1 ft, and you get a full length of 9.2 inches after the pole has been fully extended. That overall length of 9.2 ft increases your reach and allow you to trim and shape tall hedges in your yard without ever needing a ladder. You can extend and lock the pole at the exact length you’re okay with, allowing you to work at a height that’s comfortable with you, or according to the height of the hedges you have to trim. As for the trimmer head, it comes fitted with a laser cutting blade with a 20 inches cutting capacity which is made of rust-resistant hardened steel for added durability. Just like the previous trimmers I’ve reviewed in this article, the trimmer head for the Garcare GPHT07 can be rotated or pivoted into different directions for a versatile cutting experience. The Garcare GPHT07 trimmer head can be pivoted and locked into 6 different angles to help you cut and shape hedges accordingly. Powering the whole setup is a 4.3 Amps motor which provides the power needed to drive the trimmer blade effortless through the overgrown hedges and shrubs you plan to trim with it. Overall, the Garcare GPHT07 telescopic hedge trimmer one among many telescopic hedge trimmers you’ll really come to appreciate if you decide to let your wallet out for it. It’s one that will afford you a very long reach to really reach and trim tall hedges and shrubs without needing a ladder.